Link in Profile lives on a page on your own WordPress site. This means that once you create the page and set up the corresponding page menus, you can place the link in your Instagram profile and send traffic directly back to your site. 1. 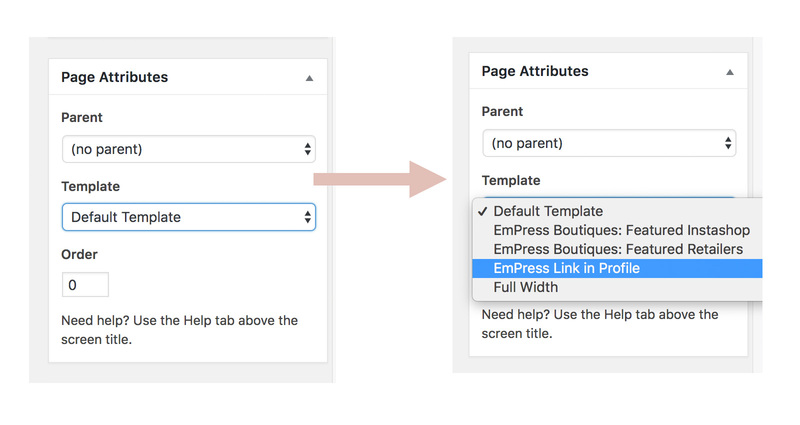 Once the plugin is installed and activated, create a new page by going to Pages → Add New. 2. Name the page Instagram, or Explore, or any title that will make sense for your users if they land there from Instagram. 3. On the right side of the screen, look for the Page Attributes box. You will see a dropdown with Default Template already selected. Click on this dropdown, then select EmPress Link in Profile. 4. Important: Next, click Save Draft for the template to commit and load, so you can input your content. The page will reload, and the corresponding fields for the Link in Profile template will load. Using the new editor and not seeing the new fields? Learn more here. 5. Begin filling in the fields as prompted. For a breakdown of what each field corresponds to, click here!